Hosting a pizza night is a great way to have your mates over for dinner without the stress of preparing a complicated meal. Pizza is easy to make and most of the work can be done in advance. All you need to do is prepare a large batch of pizza dough and a variety of toppings. Pizza is cooked in around ten minutes so you can line them up and cook to order! Here’s a really simple recipe for pizza dough. Make this well in advance as it needs time to rise. This should make sufficient dough for about four pizzas, depending on whether you prefer a thin or thicker base. To make the dough, mix the flour, yeast and salt together in a large mixing bowl and carefully stir in the olive oil and milk. Gradually add the water, mixing well to form a soft dough. Turn the dough out on to a floured work surface and knead for about five minutes, until the dough is smooth and elastic. Transfer to a clean bowl, cover with a damp tea towel and leave to rise for about 11/2 hours, until the dough has doubled in size. Use regular ham and button mushrooms, or splash out on some Parma ham and porcini. These both have strong flavours so you won’t need that much. Just crumble the goats’ cheese over the pizza and scatter with chopped sun-dried tomatoes. Layer your pizza with thick slices of plum tomatoes and buffalo mozzarella. Scatter shredded, cooked chicken over the pizza and then put blobs of green pesto amongst it – delicious! When you are ready to cook, divide the dough into even-sized balls (about four, if you like a thin base). Flour a work surface and roll them out, or just pull and stretch the dough (for a more rustic look) into the shape of pizza bases. Preheat the oven to a fairly hot temperature (remembering to adjust accordingly, if you have a fan oven). Lightly rub some oil on a baking sheet and place this in the oven a couple of minutes before you’re ready to cook. This will help to cook the pizza base underneath, as well. Add your toppings just before you’re ready to cook, to keep everything nice and fresh. Place a spoon of tomato in the centre of the pizza and spread it out evenly with the back of the spoon. Add the other toppings and carefully place the pizza on the hot baking sheet. As a rough guide, the pizza will take about 8-12 minutes to cook, depending on the toppings. Keep checking it regularly, as just a minute too much could ruin it. 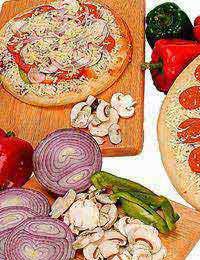 A pizza night is a very sociable way of eating, as everyone can get involved in preparing and cooking the pizzas. It’s also great for when you’re watching a film or a football match as they can be cooked in half time.